The Coconut Hut has five layers of fun AND a bell to really get your attention. The tropical coconuts enclose two calicum and bee pollen enriched mineral blocks. The middle layer has a cuttlebone for even more calcium and chewing fun. 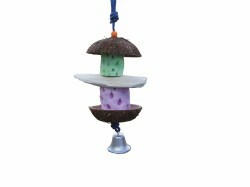 Polly's uses bird safe rope and a quick link to secure this toy in place. Approximately 8" tall and 4" in diameter.